Please post your bugs with screenshots in this thread - remember this is a developer preview and may have bugs that some see, some don't. YO YO Singh2 likes this. James8561, despertador, VinceGio and 20 others like this. This is my second day on this update and I haven't seen any known bugs yet. No matter what I've tried custom ringtones/notifications does not show up when put in the Ringtones folder. All are less than 3 seconds long, ~25kb in size and DRM free mp3s. Even a package of Borderlands 2 sounds released by Major Nelson is missing. Tried with Nokia Ringtone Maker but the sounds doesn't show up in the music hub even if they're in the music folder so no luck there. The custom ring tones do work I download free ringtones its the white music note with a blue background download your ring tones from it and save to phone once that's done go to your ringtone selection and your downloads will be under custom and there's your custom ring tones for all options. And yes its cumbersome just to change your notificatios to custom. Lumia 925 has shutdown twice already while in my pocket. There's a delay between pressing screen wake up button and actual wake up. Two bugs, both significant IMO. The new ( x ) button flickers when you swipe between 3 or more apps. pmhgeneral, nitin88, akks and 2 others like this. EDIT: Got the DRM free tones (I converted them from WAV to MP3) to show up in music hub, but nokia ringtone maker can't open them... Can't figure out whats wrong! Last edited by IzaacJ; 10-15-2013 at 02:20 PM. My 920 tried to choke me while I was sleeping, but I'm sure MS will work out that bug when it gets officially rolled out. jvanlew, Chief_Adu, mrshamoozoo and 12 others like this. Wifi crashed overnight while wireless charging. This was the first time that has happened for me. I went to settings, Wifi showed it was on and searching, but nothing showing up in the list. Also, I couldn't toggle wifi off (grayed out), so I had to reboot the phone. Worked normally after reboot though. When someone calls me, sometimes the "slide up to answer" doesn't appear. JainPrateek, DecadeMoon, nitin88 and 4 others like this. Anyone else with the GDR3 update having issues adding custom tones to their device? I've connected the device to my computer (Windows 7), open My Computer > Right click on the Lumia 1020 icon > explore / open > open "Ringtones" folder > drag / drop the .mp3 tones to that folder..
Edit: sending them to my phone via xxxxxxxxxx@mms.att.net and attaching to the e-mail, works. When delivered, I can save them to the device with no issue. Last edited by tbonecopper; 10-15-2013 at 07:53 PM. I am not sure if this qualifies as a bug, but it annoys me. 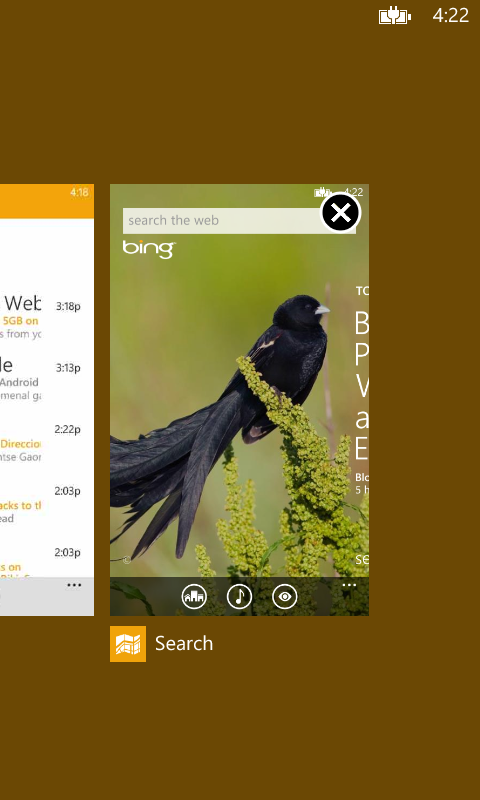 Here is the situation: when you have multiple applications open and you are on the start screen, the multitasking screen shows the start screen, however when you are in an application and enter the multitasking screen, the start screen isn't there. You have to press the start button. Can anyone comment on whether this was the case in GDR2? As far as I understand it, the app itself closes but the background process that actually plays the music doesn't close, so I think it's not a bug. Amna11S, androidtoWM, eric12341 and 1 others like this. That's what. is the background process(if any) for other apps actually getting killed? That was the whole purpose of the x i guess..the memory for all the open apps that are in background should be released when x is pressed as far as i think. Any rare LINE users will notice you cannot see what you are typing, the bar is hidden below the keyboard =__= ugh..
prasadboppana and rain620 like this. What about whatsapp anyone with any problem? Ok, this one may or may not be related to the update. I couldn't get the store to load while on WiFi, however, I could search an app by name and could load Nokia Collection. Turned off WiFi and loaded over LTE, closed store and now seems to function with WiFi back on. Check and notify when updates are available is now missing from phone update. The only option now is to automatically download.